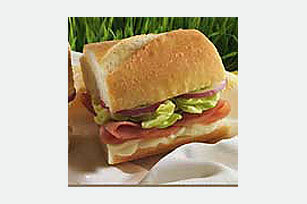 Preparing a delicious sandwich only takes a few minutes when you follow this tasty recipe. It's perfect to take to school or a picnic. Spread mustard onto cut sides of bread. Spread bottom halves of bread with cheese. Substitute 1 Tbsp. of GREY POUPON Dijon Mustard mixed with 1 tsp. honey for the GREY POUPON Savory Honey Mustard. Substitute PHILADELPHIA Chive & Onion Cream Cheese Spread for the brie.